This is a simple broccoli casserole but everyone that tries it loves it. It has become one of my staple casseroles at work or when I’m asked to bring a dish to a dinner party. Cook broccoli for 1/2 the normal cooking time per package directions. Broccoli should be half done, not fully cooked. In a mixing bowl, combine the soup, mayonnaise, onion, egg, salt and pepper until well blended. 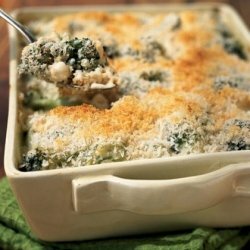 In a casserole dish, put 1/2 the half cooked broccoli on the bottom of the dish.Top with 1/2 the shredded cheese, then 1/2 the soup mixture. Repeat a second layer and top with bread crumbs or crushed saltine crackers. Drizzle top with melted butter. Bake at 325 for 20-30 minutes or until casserole is bubbly and top has browned. This entry was posted in Vegetable Side and tagged broccoli casserole, broccoli cheese, broccoli mushroom, broccoli supreme casserole by quarlj01. Bookmark the permalink.